Super Foods is a fancy buzzword for food that contains extraordinary nutritional potency and health forming benefits far beyond normal food. Or in other words, real food, not that processed stuff. Each week we’re going to talk about a “super food” that we grow here. What it is, why it’s so good and how to cook it. But not some fancy recipe that takes 20 other ingredients. I’m all about simple, healthy & FAST. We’re st arting with Asparagus. It’s one of the first foods of spring, and packed with nutrients. It’s a good source of fiber, folate, vitamins A, C, E & K as well as chromium, a trace mineral that enhances the ability of insulin to transport glucose from the bloodstream to the cells. It’s packed with antioxidants, and glutathione, a detoxifying compound that helps break down carcinogens. It also contains high levels of the amino acid asparagine, which is a natural diuretic. And yes, eating asparagus makes your pee smell. 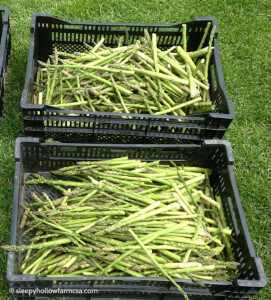 While I’ve eaten asparagus raw, there are ways to cook it to maximize the benefits of all it’s nutrients. You can roast, grill or stir-fry it – simply lightly coat it in olive oil, season with sea salt & pepper & grill for 2-3 minutes, roast for about 5 or stir-fry until it’s al dente, but not soft. For grilling, I prefer the larger spears, for roasting or stir-fry, the thinner ones work better. Toss freshly cooked pasta with roasted asparagus and olive oil. Add in some of your favorite spices like thyme or rosemary. In Spring, there’s nothing is better than adding fresh asparagus to any meal. This year, we’ll be adding another 1,000 crowns to our asparagus patch to keep up with the demand for this super food.